Yesterday we sent the completed draft of TMDM to ISO for publication as an International Standard. This means that the first part of the new Topic Maps standard is finally completed, finished, finalized, and ready. A few months from now (not sure how many), you'll be able to go the online ISO store and buy either a PDF version of the standard or a paper one. For those who don't want to, a free version is on isotopicmaps.org. So, implementors, go ye forth and implement! Today we are sending the FDIS (Final Draft International Standard) version of XTM 2.0 to ISO. This means that the ballot will start quite soon, and once passed, XTM 2.0 will be ready to go through the same process. Once that's done the new version of ISO 13250 will essentially have replaced the old version, even though a few more pieces are still on the way (these all go beyond the old version). This also marks the completion of a long personal journey that started in October 2000, and then gradually gathered speed from there. Since then, there has been lots of hard thinking, quite a bit of fighting, and lots of contributions of all kinds from many, many people. This is a big day for me; I really ought to celebrate. WOW!! Congratulation!! I want to give you BIG applause! бл^^бЛ You did excellent for ISO, I know. Congratulation, Lars! That's great news! Congratulations. 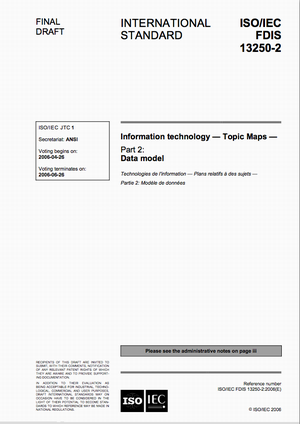 For those who want to get their hands on right away, my Topic Maps solution Topincs is based on the TMDM. It is NOT fully compliant (yet), but now that the final draft was sent out, there is another reason to tackle that issue. It does export valid XTM 2.0, though. An online demo will be available soon!